In a city renowned for its cutting-edge genetics and biotech research, voodoo priests are quietly treating patients mainstream medicine has failed. Do boston's doctors have something to learn from these underground faith healers? One evening a little more than a year ago, a man arrived at Brigham and Women's Hospital with a puzzling assortment of symptoms. He had a 104-degree fever, a severe cough, and a large lump on one of his testicles, and was also experiencing hallucinations that were causing him to become increasingly agitated. The patient, a Haitian-American in his late thirties, had no history of serious illnesses. Now, almost overnight, he had become violently ill. As standard procedure, he was given an in-depth physical exam, but the interns and residents who were attending to him could not figure out what to make of his condition. They called a more senior physician, Dr. Green (whose name has been changed at his request), who had a reputation for successfully handling such perplexing cases. Green had trained at Johns Hopkins School of Medicine and spent a fair amount of time in rural Africa, and despite his relative youth had seen his share of obscure syndromes. But this time, he was totally flummoxed. Sure we've got cutting-edge genetic and biotech research in this town, but if that doesn't cure what ails you, how about a little voodoo? Illustration by Hungry Dog Studio. "The patient's fever appeared to be cyclical," recalls Green. "One afternoon, his temperature spiked, and he started running down the hallway and screaming about the devils that were causing his illness. He had to be restrained by several security guards." Alarmed, Green and his colleagues ran a number of blood tests and consulted a small army of specialists from oncology, rheumatology, and infectious disease. Still no one could figure out what was wrong. With no way to help his patient and no explanations, Green sat down with the patient's family for what he knew would be an uncomfortable conversation. They listened attentively and then, rather sheepishly, posited their own theory for what was wrong: The man believed he may have been put under a voodoo curse. The idea caused a stir among Green and his colleagues. "It was a very bad situation," he says. "They were upset. We were upset. But we didn't know what to tell them. Not long after that, the patient died. And we still didn't have a diagnosis." For Green, the most troubling thing about losing his patient above and beyond the fact that he was unable to save him was the possibility that the man perished because he believed he was doomed. "The will to live is extremely important. And when it goes," he says, "your health may fall apart." But doctors aren't necessarily in the business of psychological encouragement, especially when circumstances are dire and a diagnosis is unclear. It would have been irresponsible perhaps even unethical for Green to tell his patient not to despair. One healthcare specialist who would have had a great deal to say about Green's mysterious patient is Neite Decimus. Decimus is regarded as Boston's top voodoo priest, the most well established of the dozen or so who practice in the area. He is a tall, 37-year-old man with smooth black skin, gleaming white teeth, and a meticulously trimmed goatee. When I first met him, in the lobby of the Kendall Hotel in downtown Cambridge, he was wearing tapered black pants, a light cotton shirt, and a heavy gold chain with a cross on it, which he caught me eyeing almost immediately. "I am not Catholic," he explained in a thick Haitian accent. "I wear the cross because we in the voodoo faith see Jesus as a prophet." He then handed me his business card: Neite Decimus For all of your magical needs! Decimus, a counselor who works the overnight shift at a South Shore mental health facility, was born and raised in central Haiti and immigrated to the United States in 1997. A few years later, he opened his voodoo practice in Brockton, which has a sizable Haitian-American community. Technically speaking, Decimus is a houngan, a voodoo priest whose specialty is healing. He inherited his "powers" from his father nearly 20 years ago. Houngans rarely, if ever, invoke curses. Those bent on invoking a voodoo curse must consult with a bókó, who buys his powers from a secret society. In a sense, these two types of priests operate almost like plaintiff and defense attorneys eternal adversaries who function symbiotically. "I only remove curses I don't ever make them," says Decimus, who claims to eradicate more than 50 each year. "Making them, of course, is where the money is. People will pay any amount of money to create a curse. But I always refuse." Voodoo curses, which allegedly cause symptoms as varied as skin rashes and marital strife, can be brought on in three ways: an enemy may level the curse by hiring a bókó; a person may fail to pay sufficient respect to his or her "spirit protector," a sort of guardian angel; or a person may bring a curse upon himself or herself by committing an injustice against someone else. To counter a curse, Decimus typically prescribes a number of remedies, including prayers and herbal tonics. 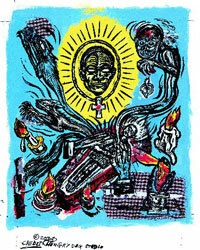 Perhaps most importantly, he works as a medium, asking various voodoo spirits to bless and forgive an afflicted person. In return, Decimus's clients pay a standard retainer of $200, then an additional $500 fee if he proves successful in removing the curse. When clients can't afford to pay (and often they can't), Decimus is ethically obligated, under the voodoo equivalent of the Hippocratic oath, to help anyway. According to Decimus, his practice earns him less than $10,000 a year. Though voodoo is largely considered taboo among Haitian Americans of which about 40,000 reside in the Boston area its traditions and superstitions remain deeply ingrained. Professor Marc Prou, an expert in voodoo and executive director of the Haitian Studies Association at UMass Boston, discovered this firsthand in the late '80s and early '90s while working in the Dorchester area with Haitian-born HIV patients, many of whom believed that they had been cursed. Prou encouraged his patients to put their faith in modern medicine an option that, more often than not, was never available to them back home. "Once they saw that these doctors could really help them," says Prou, "it was an easy sell." Which is to say that when modern medicine works, it is very persuasive. But if it fails or isn't available people will often look wherever they can to find hope. And hope, in a way, is exactly what Decimus is selling. Many, if not most, of his clients are despondent when they come to him. They often will have tried numerous more-traditional therapies without finding relief. Carmel, a Haitian-American social worker in Dorchester who declined to give her last name, admits that she has no qualms about referring her most desperate cases to Decimus. "I see people who have health problems that can't be diagnosed or romantic problems that won't go away," she says, "and I refer them to Neite." As strongly as he believes in the power of voodoo, Decimus does not think of himself as a replacement for mainstream care so much as a backup. If a client exhibits symptoms of heart disease, cancer, or diabetes, Decimus sends him or her directly to a hospital. The range of cases he handles is nonetheless considerable. Recently he treated a woman who had been suffering from a severe rash over much of her body for nearly two years. Doctors at both Beth Israel and Brigham and Women's hospitals were unable to diagnose the ailment. Decimus cured her in a matter of months. Another patient describes how Decimus eliminated her chronic back and stomach pains. Others told me about what Decimus had done to heal their psyches. One client, who travels twice a year from Florida to see him, explained that Decimus helped her cope with, and distance herself from, an abusive husband. "He is like a therapist and a voodoo priest all wrapped up in one," she says. (It's a fitting summation: Decimus is currently pursuing a master's degree in psychology at Bridgewater State College.) Another man swears his depression, suicidal tendencies, and bad luck began to turn around the moment he learned about Decimus's practice. After just one phone call, the man says, his life returned to normal. Time and again, Decimus's clients told me a similar story: They came to him feeling at a loss. He diagnosed, then removed, a curse. And before long, their worries disappeared. As it turns out, doctors have been studying the interplay of voodoo, hope, and mainstream medicine since as far back as the 1920s. Dr. Walter B. Cannon, who taught at Harvard Medical School, spent a good deal of his spare time researching the history of voodoo and other forms of witchcraft. In 1942, he published a landmark paper called "вЂ�Voodoo' Death." In it, he cites a number of well documented cases in which cursed men and women died of fright unless they were given the hope of a remedy. One chilling section details an aboriginal curse invoked by pointing a bone: "The man who discovers that he is being boned by an enemy is, indeed, a pitiable sightвЂ¦. From this time onwards he sickens and frets, refusing to eat and keeping aloof from the daily affairs of the tribe. Unless help is forthcoming in the shape of a counter-charmвЂ¦his death is only a matter of a comparatively short time." Fifteen years later, C.P. Richter, another medical academic who studied the notion of voodoo death, conducted a series of experiments on wild rats, placing them in small jars partially filled with water. The rats were in no danger of drowning, but there was no way for them to escape. In short, it was a hopeless situation. Many died within hours. Richter believed that the animals had essentially given up, and speculated that victims of voodoo death basically do the same thing. These obscure studies dovetail with present-day researchers' growing interest in how hope affects life expectancy. Their findings indicate a strong correlation between hopelessness and mortality. According to a study published in the journal Psychosomatic Medicine, men who described themselves as feeling hopeless were at significantly higher risk of dying from cancer, heart attacks, and most curiously even violence. In another study, conducted between 1992 and 1996, roughly 800 senior citizens filled out surveys describing their level of optimism; by 1999, the mortality rate among the self-described hopeless subjects was almost three times higher than among the hopeful. Putting hard scientific data to what has long been accepted folk wisdom, the New England Journal of Medicine recently reported that a person's risk of death is significantly higher during the year following the illness of a spouse. Neurologist Dr. Martin Samuels, also of Harvard Medical School, has devoted the past 25 years to studying the mind-body connection that causes otherwise healthy people to die suddenly from fright. Even as breakthroughs in genetics and bioengineering hurtle medicine toward new frontiers, the fact is that a lot of patients, regardless of their ethnic background, continue to want to trust their fate to a higher power. According to a Newsweek poll, 72 percent of Americans think praying to God can cure someone of an illness, even if doctors say death is imminent. In another survey, psychologist Kenneth Pargament of Bowling Green State University spent two years following some 600 patients dealing with diseases ranging from cancer to gastrointestinal disorders. He found that those who wondered if God had abandoned them, questioned God's love, or thought the devil had a role in their illness were nearly 30 percent more likely to die than their counterparts. Those studies, and others like them, have health officials looking seriously at the healing power of hope: This year, a division of the National Institutes of Health is using its $112 million budget to explore faith-based health initiatives and alternative medicine. The nation's medical schools are following suit; more than two-thirds now offer courses in health and spirituality. In an ideal world, Decimus says, he would work in cooperation with doctors as a specialist, not unlike an acupuncturist or a homeopath, called in when experts are stumped. But the medical community isn't ready to take that leap; to their toughest critics, faith healers like Decimus are scam artists peddling placebos to the distraught. At one point, near the end of our conversation, I asked him what he says to those skeptics, and whether he can help them, too, despite their doubts. "When things get bad when things get out of control most people believe in voodoo," he replied calmly. "And then I am always there to help."